Milwaukee River view from riverwalk. 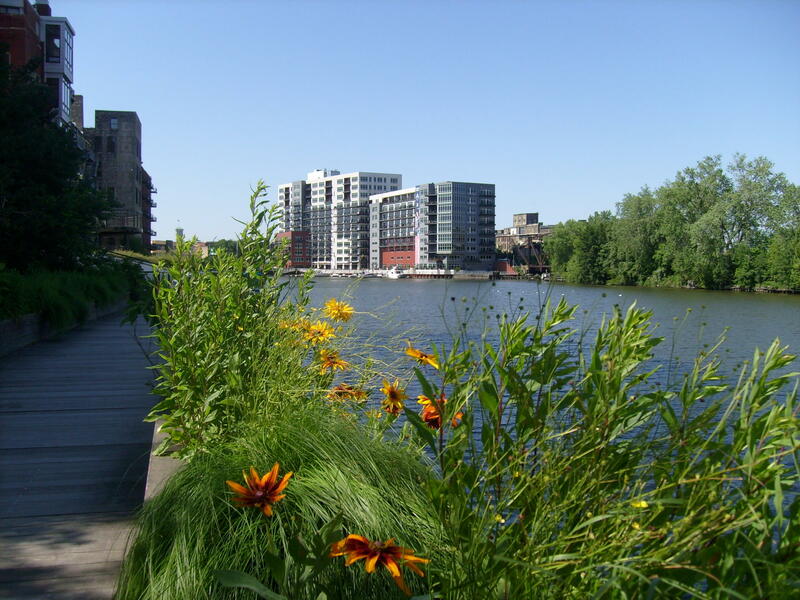 The Milwaukee River basin is markedly cleaner than a few decades ago. The heavy industries that used to pour toxins into the water have closed or are now regulated, and the deep tunnel system has dramatically reduced storm water overflows into the river. But challenges remain. Friday the Wisconsin DNR released a plan in draft form to remove more pollutants from the basin, which consists of the Milwaukee, Menomonee and Kinnickinnic Rivers' watersheds as well as the Milwaukee Harbor estuary. A public information meeting held Monday in Wauwatosa. 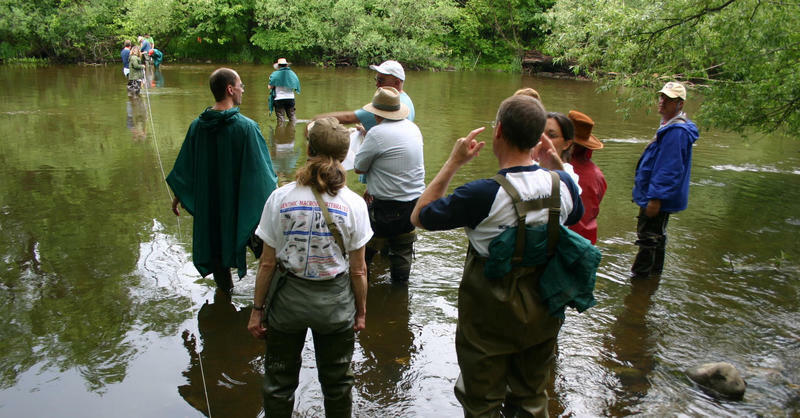 “[The plan] sets the amount pollutants a water body can receive and still meet water quality standards,” says Kevin Kirsch, water resource engineer with the Wisconsin DNR. He says the Clean Water Act represents the underpinnings of the Milwaukee River basin plan. The federal law demands that waters be swimmable and fishable. But areas of the basin – its rivers and estuary – remain impaired. 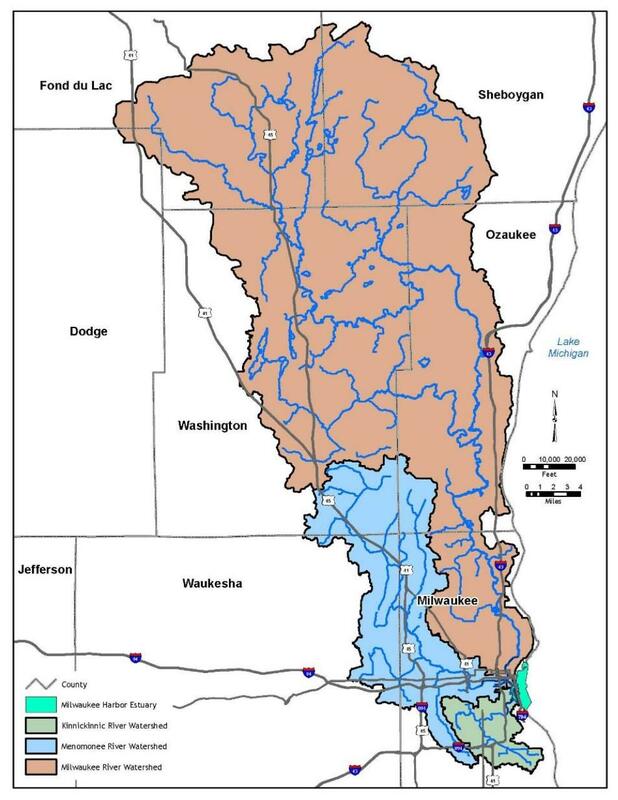 Milwaukee River Basin includes the Milwaukee, Menomonee and Kinnickinnic River watersheds and the estuary. He says the DNR's strategy aims to remove the impaired status by reducing phosphorus, bacteria, sediment and total suspended solids, or TSS. “The fine particles that would stay in suspension in the water column and kind of give it that chocolate milk kind of look during a storm event. And then the sediment is the larger particles that would settle out and kind of fill up the channel and smother habitat,” he says. Kirsch says sediment and TSS can also absorb other pollutants. “So by controlling that pollutant, we’re also getting a lot of other pollutants, metals, stuff like that,” he says. The plan zeroes in on nonpoint pollution – the kind that flows off surfaces – from upstream farm fields to urbanized parking lots into Milwaukee’s rivers and ultimately Lake Michigan. Kirsch says agriculture falls under a special category within the TMDL plan. “It’s a little nuanced with agriculture," he explains. "We do have as performance standard agriculture, just like we have for the urban areas – for both storm water, agriculture and urban. I think where the nuance comes in, is there is a statutory requirement in Wisconsin that it is not a requirement unless cost share money is made available to the producers." The Kinnickinnic River - one of three that form the Milwaukee River Basin. In other words, the plan would be voluntary for farmers, unless for example, they teamed up with municipalities to subsidize farm-based, pollutant-curbing projects. It’s part of the implementation strategy. There are lots of different programs available," Kirsch says. 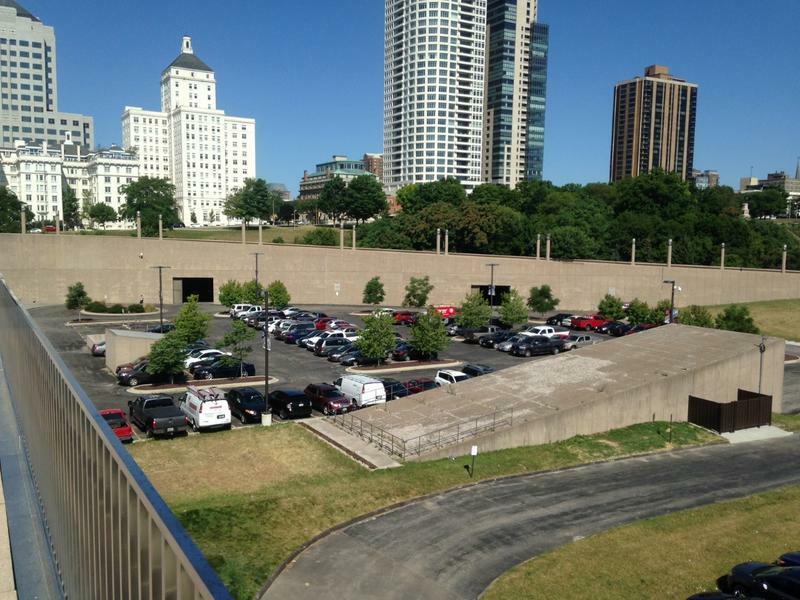 The EPA will have the ultimate say on the Milwaukee River basin plan. However, Kirsch says it won’t be ready for weeks. The DNR still plans to meet with stakeholders to confer separately with industry, municipalities and farms; then the public will be able to comment. We’ll be following the process and how it could affect different inhabitants of the basin. Tuesday, Midwest Environmental Advocates filed a request with the EPA demanding an investigation. If a rain drop were human, a human who liked to hang out in Lake Michigan, it would love to fall on the big parking lot north of Milwaukee County’s War Memorial Center. “In this situation, all of the stormwater flows directly into the lake,” says Phil Schultz. He's chair of the Rotary Club of Milwaukee's environment and ecology committee. The club rents space in the War Memorial and holds meetings there. Cleaning up the Milwaukee River Basin, made up of the Menomonee, Kinnickinnic and Milwaukee Rivers, has become a decades-long endeavor. 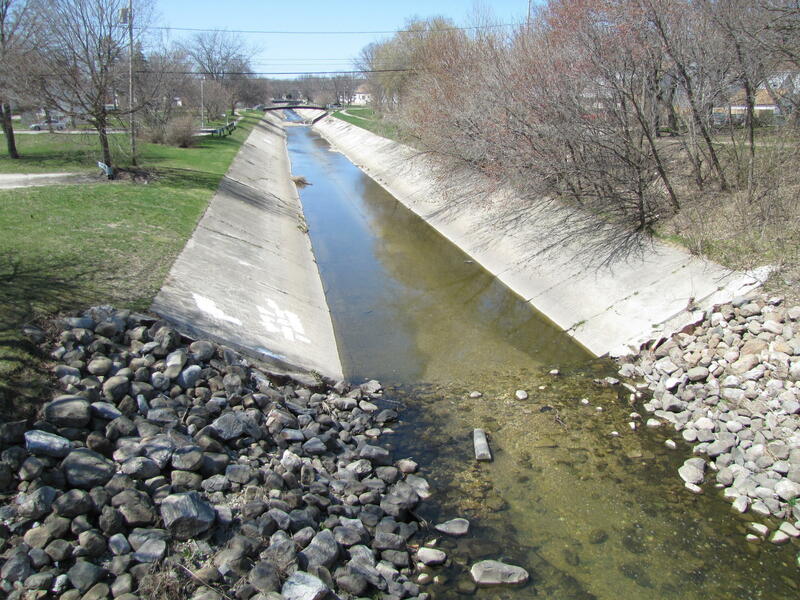 Over time crews have removed dams, hauled out contaminated sediment and naturalized some stretches of once concrete-lined waterways. Volunteers have also played a part. 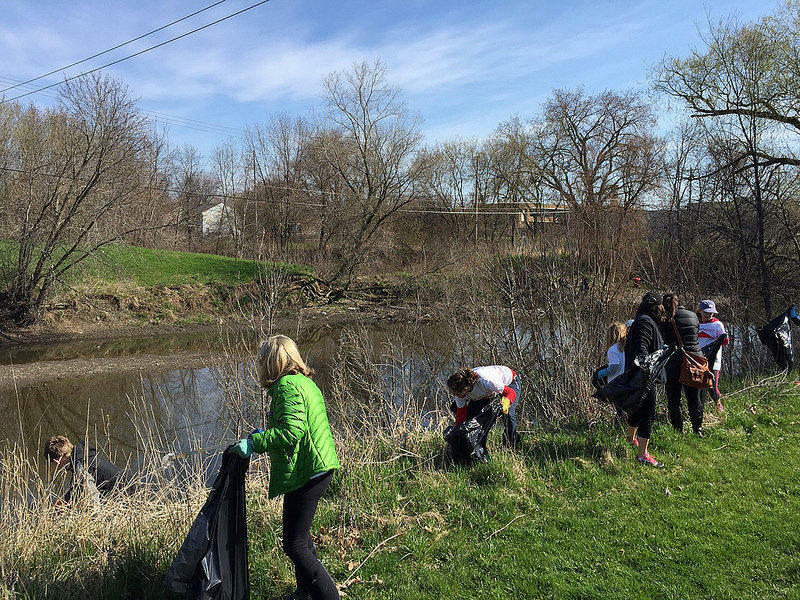 Saturday marked the 21st annual cleanup coordinated by the group Milwaukee Riverkeeper. Teams slipped on gloves and boots to remove debris by the bagful at sites from Campbellsport south to Cudahy. It was site captain Mitch Kulis' third cleanup. The health of Milwaukee’s rivers is improving, slightly, according to the 3rd annual report card from the Milwaukee Riverkeeper group.